Climate change means the way the world’s weather has changed over a long period of time. 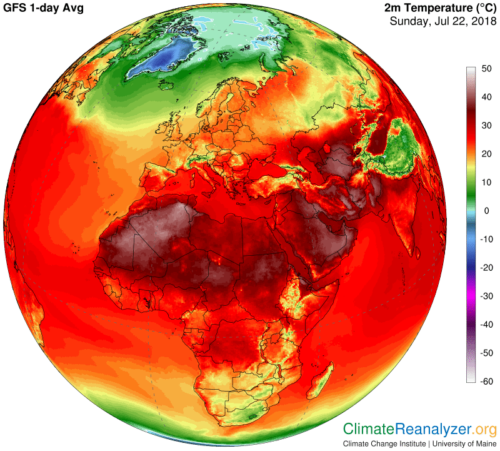 Global warming (hotter air temperatures around the world) is one example of climate change. A group of scientists from the United Nations (UN) have warned that the world must take strong action right away in order to avoid many serious effects of climate change. Since people first began burning coal to run factories, the world’s temperature has gone up by 1 degree Celsius (C)*. One degree may not sound like much, but it’s enough to cause serious long-term changes in weather patterns that affect all life on earth. This is climate change. This image shows that temperatures have gone up by about 1°C since the 1880s. The higher temperatures change weather patterns and bring more extreme weather. Now scientists are trying to figure out how to limit future temperature increases. As humans burn “fossil fuels” like coal, oil, and natural gas to make energy, the world gets hotter. Burning fossil fuels adds carbon dioxide (CO2) and other pollution to the air. The more CO2, the more the Earth heats up. In 2015, the world’s countries signed the “Paris Agreement” to work together to slow global warming. The Paris Agreement set goals for countries to pollute less by replacing fossil fuel energy with energy that doesn’t pollute, such as solar, wind, and water power. 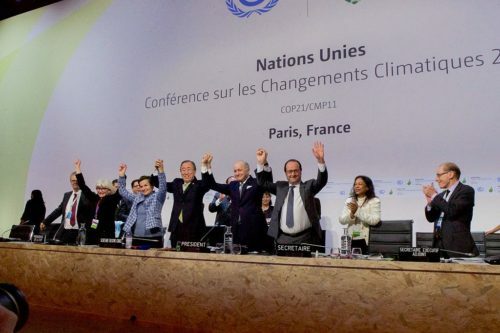 In 2015, all of the world’s countries signed the Paris Agreement. The agreement set goals to limit the rise of temperatures to 2°C. This picture was taken after all 196 countries agreed to the Paris Agreement. For most governments, the goal of the Paris Agreement was to limit the rise in the earth’s temperature to 2 degrees C. When people talk about these 2 degrees, it’s important to remember that 1 degree is already used up by the temperature change humans have already caused. So the Paris Agreement was really trying to keep the earth from getting 1 degree warmer than it is now. Most countries are not doing what they need to do to meet that agreement. Now a group of over 90 scientists from 40 different countries have created a report showing that the world will be much better off if we can limit global warming to 1.5° C (0.5 degrees warmer than now). They warn that the world will reach this temperature in about 12 years unless all countries work together to solve the problem. Droughts – long periods without rain – are one effect of climate change. Other effects include wildfires, record rains, and strong hurricanes. 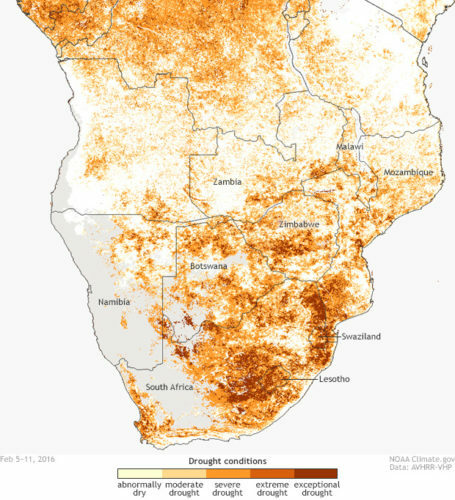 This picture shows drought conditions in southern Africa in 2016. The effects of climate change can already be seen around the world. Ice is melting in the Arctic and Antarctic. Higher temperatures have led to heat waves, record dry periods, wildfires, record rains, and more strong hurricanes. 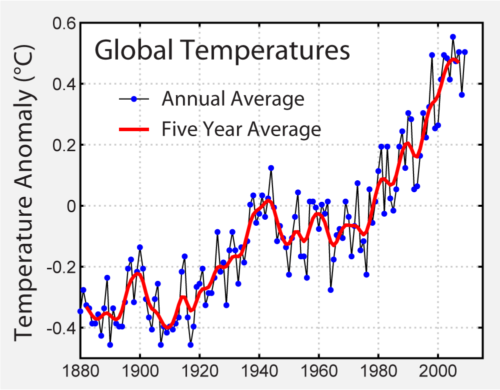 The differences between the world’s temperature rising 0.5°C and 1°C are big. Both cases are bad – seas will rise, coasts will be flooded, heatwaves will get worse, many kinds of animals will die out, and millions of people will be left without food or water. But if the temperature is allowed to go up 1°C instead of just 0.5°C, things will be much, much worse. The differences between the world’s temperature rising 0.5°C and 1°C are big. Both cases are bad – but the higher temperature will be much, much worse. The report says that it is possible for the world to meet the lower goal. But to do so, all governments around the world will have to work together in ways they have not done before. To reach the goal, the world will need to quickly move to energy that does not give off CO2. This is the hardest part, since today’s world depends greatly on energy from fossil fuels. To reach the goal, the world needs to use energy that does not give off CO2. This is hard, since the world today depends greatly on energy from fossil fuels. 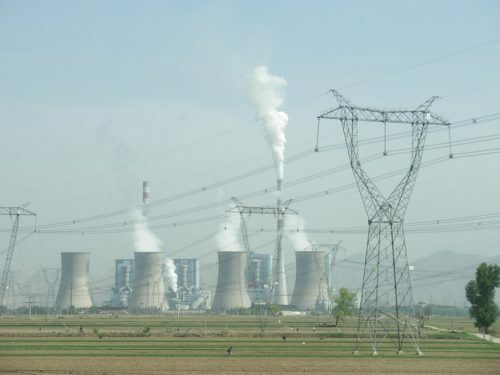 This picture shows a coal burning power plant in China. CO2 will also need to be removed from the air. This can be done now, but it costs a lot of money and doesn’t work very well. The world will need to plant huge areas of trees, which will also help remove CO2. The biggest challenge will be forcing governments to take action quickly. Climate change is such a big problem that many people wonder if anything they do can really make a difference. While the big decisions may be made by governments, people can get together and try to make sure their government takes strong action. When heat waves on land cause wildfires, people see them and notice them. 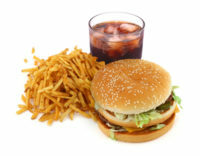 But scientists are warning that heat waves in the oceans may be causing as much or more damage.